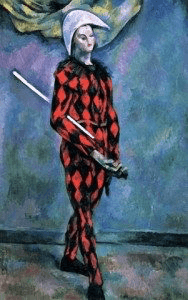 Hark, the Harlequins are Closing In! Mid-August is about the time of year when we really begin to see the Harlequin bug show up in our gardens. 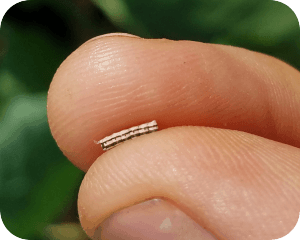 Widespread in Southern regions, Philadelphia and Chester County are about as far North as this pernicious pest has managed to establish itself. The Harlequin bug is about the size and shape of a stink bug (with an armored shell protecting retractable wings) and earned its name because of its bright, distinctive coloration. 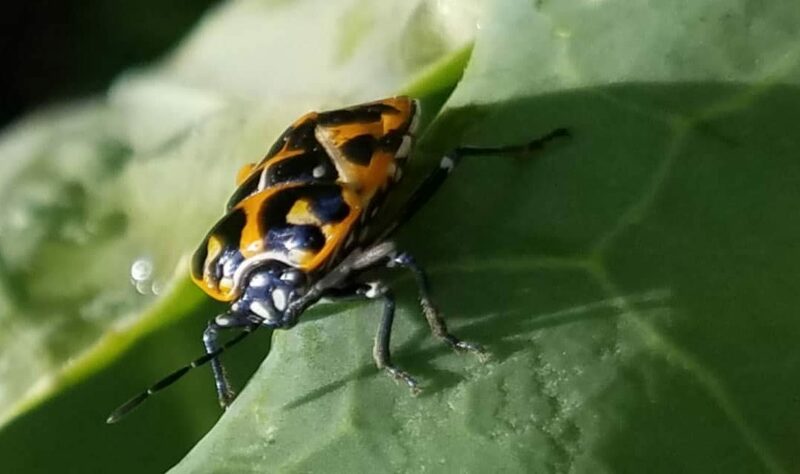 Harlequins are attracted to all plants within the Brassicaceae or Cruciferae family (cabbage, kale, mustard greens, broccoli, cauliflower, etc), and can cause severe crop damage if left unchecked. The good news is that they are easy to spot at every stage of their development. The bad news is that there are few options for controlling their spread in an organic manner (detailed below). 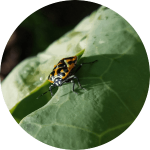 With harlequin bugs the best defense is a good offense, and you can do for your crops a huge favor by catching them early. If your garden has any of the crops listed above, take time on a regular basis to check the leaves carefully. 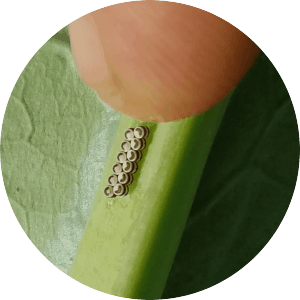 Often you will find pests hanging out on the underside of the leaves, so some diligence is required. Once you’ve located any harlequins, they can be disposed of either by crushing them or by using the following method. What you’ll need: a cup or glass of soapy water. A little bit of dish soap is sufficient to break the surface tension of the water, which means bugs sink instead of float when they fall in. Only fill it halfway to avoid spillage. 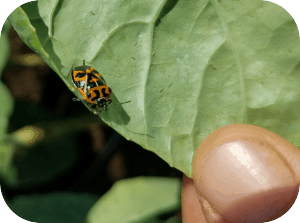 Harlequin bugs employ a defense mechanism of letting go of the leaf when they feel threatened, so by holding the cup of soapy water underneath them and slowly approaching them with your finger they usually drop right in. Otherwise they can be knocked or flicked into the water. If they do drop to the soil they can be picked up and put in the water. They don’t sting or stink when handled. Egg formations come in clusters of twelve and look like two rows of black and white barrels. 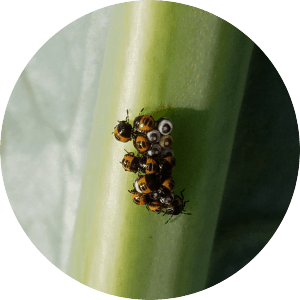 They can be found on the underside of leaves and stems. The clusters are hard to the touch and with a little nudge will detach en masse from where they are fixed to the plant material. They can be dropped into the water or otherwise removed from the garden. If the nymphs have emerged from their eggs it is much more difficult to get them into soapy water, so crushing them is recommended. If you are squeamish about tiny creepy-crawlers, it helps to have a napkin or paper towel on hand. Again the amount of damage a well-established harlequin population can inflict on your garden is incredible, so keeping them from getting the numbers in the first place is the name of the game. Easy to handle! No goop!